Useful people are enchanting. In the days following my job loss, seeing the postal service truck drive by caused my heart to beam in admiration. Even today, the sight of the man walking from house to house—touching lives with every stop—makes me happy. Rather than whine about not having many useful examples while growing up, I am admiring a variety of individuals today as I grapple along while finding my way. I still recall delivering my book by bike to a former co-worker on April 8th. It was 33 degrees, wet, and I rode straight into a relentless headwind coming off Lake Superior. This was one of my first deliveries, and I wrestled with what the heck I was doing and why. I don’t suppose I came up with any “answers,” but kept pushing forward anyway. SLOWLY. It’s a lot like life in this crisis conveniently occurring at mid-life, during which I’m attempting to lead my family down an unconventional path. After being warmed by the fire of conversation and basking in the well-wishes of my new friend, I turned down the gravel road that would lead me back down to Lake Superior. A truck, no doubt driven by a useful person, thundered by that triggered longings of usefulness. The tailgate was emblazoned with the slogan, “Welders on Wheels.” Now that kind of work is practical. Useful. Productive. Constructive. I longed to chat with the man over coffee, but no doubt he had places to be. It’s funny how such quick encounters can affect someone in my shoes. I also admire the man in the pickup truck that stopped to help the woman traveling alone with three kids, stranded along a busy road with a car that had broken down. With his calm demeanor, he exuded competence. With a tool box at his side, Leatherman on his belt, and head bent down beneath an opened hood I found his act of service to be touching. Having grown up with a single mother, I have a strong sense of what such actions mean to a mom in such desperate circumstances. Ten seconds of observation were plenty enough for me to get a sense of the woman’s gratitude. For years I was unable to adequately describe for my wife and kids what I did for a living, even though I toiled away for up to 10 hours at a stretch in the basement. I shoveled out hundreds of emails embedded in a virtual world. For 12 years I worked for two corporations. Without warning the plug was pulled. Nothing remained for me to point to and say something along the lines of, “I built that.” Like Neo from The Matrix, I was naked and bare in a strange world, wondering how I got there. At the end of this week I’ll be looking forward to showing my son and daughter where I’ve been laboring for such long hours recently. I’ll walk them through a beautiful home that I’m in the process of painting for a lovely couple. My kids will easily understand what I offered to someone else in exchange for money. This is important for men, in particular. I have a master’s degree, and this work is definitely not rocket science. There’s something to be said, however, for persevering through difficult manual labor. I’ll probably have 15-20 hours put into washing walls, sanding woodwork, speckling holes, and other glamorous work, before doing anything remotely satisfying. Such work is useful, nonetheless. I feel this deep sense of gratitude and respect for the house and the people who are entrusting me with it. This is their first home—just recently purchased—and they have entrusted me with it while traveling out of the country. This is an honor I don’t take lightly. In many ways they’ll be returning to a new home this weekend. I’m going the extra mile on this project with the hope that they will remember their reaction upon walking in for the rest of their lives. Our work should mean something to others. Something more than the trickle of cash into our bank accounts. This is what I’m longing for as I wade through what work and vocation will look like in this new stage of life. And yet, art is also useful to others. Here’s a picture of a lovely group of women (By the way, I’m 39 years old and still have trouble calling a collection of females in my age group “women.” It sounds so grown-up and mature, and I still feel childlike in many ways). 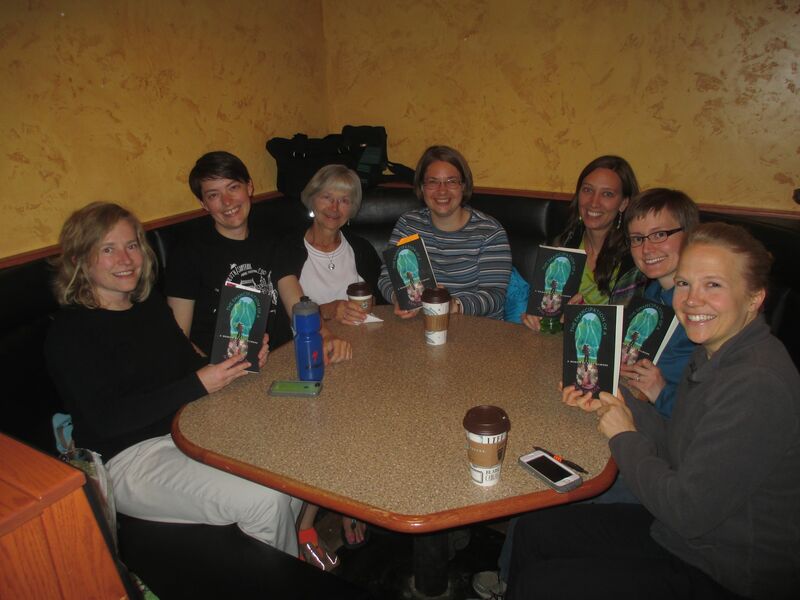 I attended this book club’s gathering at the end of last month after they read and enjoyed my memoir. What an honor it was to sit among their smiling, jovial faces. These are beautiful individuals collectively striving to be better people. I’m grateful for touching their lives in a small way on this journey. The evening was a delight. 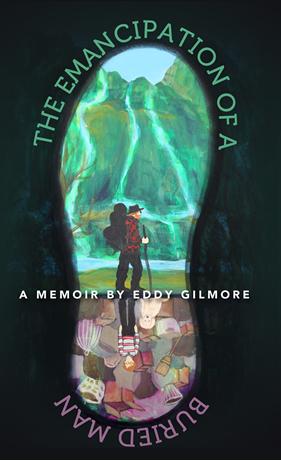 I encourage you to consider my book for your own book club. It’s the sort of story that promotes effervescent conversation organically. We stayed right up to closing time, and I biked home in the dark. Under my book tab I’ve added a link for some discussion questions. They are certainly not refined questions, but they may be a starting point for you at any rate. We only had time to formally discuss a few of them, because the conversation and discussion points occurred naturally. Finally, here’s an interesting idea for you. I am offering myself to write the stories you’ve always dreamed of writing but know you’ll never have the time. For example, perhaps you’d like a short book about a grandparent, of your family’s unique experiences, or about the history of your small business. What I bring to you is an innate ability to become intensely impassioned for your subject through the lens of a third party with keen observational skills. I am a great conversationalist, will travel out to your location, and will spend hours chatting with or about your subject. The point of this isn’t to merely glean facts, but to find footholds of interest for myself so I may write an engaging story. This is immersive writing. I will immerse myself into the story, become utterly fascinated, and will write it at your location over lets say 1 – 3 days. There’s also the benefit of it being from the perspective of a third party. I have a gift for seeing the big picture. The “essence” of people and things, if you will. Take a look at some past blog posts I’ve been doing on interesting people in order to get a general flavor. I will write the book, perhaps 60 -100 pages or thereabouts, and will handle the publishing. You will then be able to order an actual paperback book from the print-on-demand publisher. The book will be available for years and years. Order one copy or a thousand. It doesn’t matter. I should be able to crank out the text of the book over a three day period and then come home to deal with the publishing details. Somewhere around $2000 for this seems like a fair price to me, and I’d also have to charge travel expenses. If you live in southern Minnesota, for example, I’d prefer to take the bus while reading Grandpa’s favorite book (just to use that time to begin to get into his head). I don’t expect to get a lot of takers on this, but I’d be thrilled to find even one interested party out there. If you aren’t needing an actual book I could go down to $500, depending on your actual needs. It will all start out with gregarious conversation, and I’ll be writing in your spare bedroom or kitchen table. And no, it won’t be polished to the point of zero errors in punctuation. I will, however, be conveying powerful feelings that will last a lifetime. This is more important than a pointless pursuit of perfection that would cost far more than the product is worth. Take a look around the blog here for a general idea on the sort of quality you can expect. Hey, Eddie, I need both, the book and the house painted. 🙂 Ok, just kidding. I do need both, but we are doing it ourselves.. I am so with you on the useful work. Spending time putting together meaningless reports that no one will look at, it just sounds so wasteful for the whole society things that we do sometimes.. I like that idea of writing for someone. A while ago I was researching ideas of how to homeschool/unschool children as a single parent and be able to work/support them, and one single mom did precisely that, she would go find people who wanted their story to be written. Mainly older people at retirement homes. Good luck to you. If I see anyone interested in that, I will let you know.